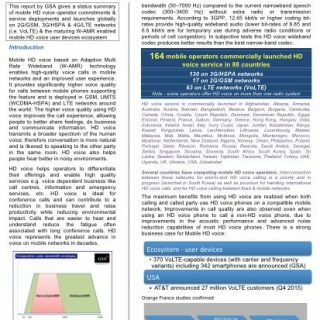 164 mobile operators launched HD voice service in 88 countries; including 63 VoLTE deployments. GSA, the Global mobile Suppliers Association, confirms that 164 mobile operators in 88 countries have launched HD voice service enabled by W-AMR technology. Some operators offer HD voice service on more than one radio system (2G/GSM, 3G/HSPA, 4G/LTE). MVNOs, trunked radio systems, and enterprise networks are excluded. 23 operators launched HD voice service during 2015, and another 10 have launched so far in 2016. The Mobile HD voice Global Update report published by GSA confirms the status of mobile HD voice operator commitments, deployments on GSM, HSPA and LTE (i.e. enabled by VoLTE) networks, service launches worldwide, and the supporting W-AMR capable devices ecosystem.